Tomoyo Yoshinaga and the rest of the Haberdasher staff have a true passion for the craft of cocktails. Photo by Greg Ramar. We live in an age when people revel in their ignorance, even when good information has never been easier to access. Save the politics. We’re talking cocktails. 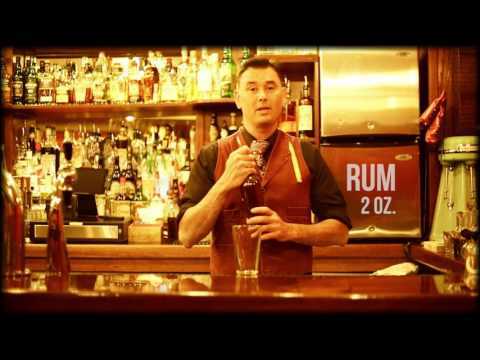 Not too long ago Haberdasher owner Cache Bouren—the progenitor of craft cocktails in Silicon Valley—sent along an instructional video on how to make a great Old Fashioned. I had a feeling something was up before the bartender filled the glass to the brim with Jim Beam. There’s an art to crafting a great cocktail and clearly some basic rules were being ignored, if not trampled upon, doused in kerosene and animal hair, and burned in effigy. Hoping to elevate our collective knowledge, we reached out to Haberdasher, located in San Jose’s SoFA District, to explain the necessary tips to cocktail like a pro this summer. It starts, of course, with good spirits and fresh ingredients, but then there are a few other rules: measured pours, ice shaken only seven to 10 seconds to prevent a drink from becoming too watery, garnishing with ingredients that fit the profile of the drink. Toki Whisky — 1 ¼ oz. Sage syrup — ¾ oz. Lemon juice — ½ oz. Pour all ingredients before adding ice. Shake 7-10 seconds. Pour into a cold glass. Get a fresh sage leaf, smack it flat, and lay it flat over the drink. Voíla! Check out SanJose.com on June 8 for a video featuring Haberdasher owner Cache Bouren’s tips to drinking well this summer. 43 W San Salvador St, San Jose. Tiki Tuesday falls on the last Tuesday of every month to feature a full tiki drink menu with Venezuela rums from Diplomatic. Also worth sliding through for Motown Mondays and tasty deep-dish mac ’n cheese every day. An eclectic mix of punches, house shots and specialty cocktails—try the Boss Tweed—grace the menu. Exquisite wood carpentry provides a smoky ambience that pairs well with live jazz on Tuesdays and dueling pianos on Sundays. Hult’s Restaurant may be better known for its colorful farm-to-table entrees, but the cocktail menu also impresses with options like Siren Eyes, Honey, Honey, Honey, and Impassioned. Jack Rose Libation House has one of the best outdoor patios in the South Bay, which and the communal seating indoors and out is the way to go with live music Friday and Saturday nights. Don’t be scared by the few Yelp reviews—the line is already out the door on weekends. Combining Asian fusion and craft cocktails, the menu features a “Southeast Mule” for those ginger beer lovers. on unique spirits and tasty Indian street food. Photo by Greg Ramar. Mortar & Pestle’s Indian street food is unique, as is the everyday Social Hour from 3-6pm. Try sweet bites like Indian Railway Cutlet and Kofta Fauja Singh and then chase with the Bangalore Old Fashioned or the Husband & Wife. Lazy date night eats paired with premium spirits make this a pizza-cocktail get together we can get behind. Get fancy and request cocktail art before making a reservation for their monthly tasting classes. A wall of spirits seemingly stretches a mile high, but the cocktail craftsmanship goes a step further. We still haven’t settled on a favorite from their 25 signature drinks. A dog-friendly patio with comfy chairs and glass fire pits make this a Santana Row favorite. Ambiance is A1 and the servers are friendly and attentive. The diverse seating arrangements make R&R intimate enough for a date and wild enough for happy hour with co-workers. Timber & Salt does a little bit of everything: craft beers, a mix of import and local wines, enough comfort food to send us to sleep. But the real stars are The Masked Dancer, Cletus Del Roy and The Great Gabbo. First rate in every way, Lexington is one of the few places to have food that rivals its stunning bar menu—Lexington offers multiple flights of scotch and single malts to melt the heart. The pride of Murphy Street, this downtown London-inspired pub is bustling with authentic ethnic cuisines from around the world and a few forceful cocktails (e.g. The Dark Side #2 by Yoda). Since expanding to take over the neighboring dry-cleaners location, The Table has more or less dethroned Bill’s for Willow Glen weekend brunch supremacy. The restaurant has a huge selection of handcrafted cocktails. After a long night, consider the Corpse Reviver #2. It’s best not to overthink it in a James Bond-inspired bar and just go with the eponymous cocktail. Also great tasty small plates. Located inside the Toll House Hotel, just about any cocktail will please but there’s just something irresistible about The Non-Vergen Mary, which includes Anaheim chile pepper-infused vodka and Sriracha.